This is believed to be one of the earliest known (possibly the earliest? )of free-standing stering silver Iona crosses, and has clear hallmarks for Birmingham 1896 but the maker's marks are either JG or JC. 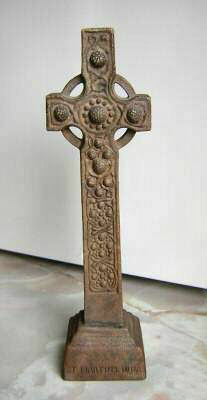 Several posibilites exist, the main one being John McGilvray of Oban, who was making Iona crosses inlaid with Iona marble since c.1885; John Collie was another Oban silversmith who made Iona silver items, but possibly not as early as this?A third possiblity is that the cross was comissioned by an Iona devotee/pilgrim from the Birmingham silver and goldsmiths John Grinsell and Sons, who in late Victorian times made some finely engraved crosses in both gold and silver, as specialities. 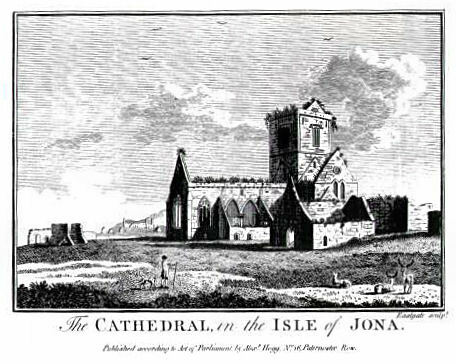 For over 300 years Iona Abbey and its buildings had remained in ruins, periodically visited over this period by intrepid travellers including the writers Boswell and Johnson, and in the 1770s by the well-known artist and engraver Pennant, who sketched the Abbey ruins on his visit. 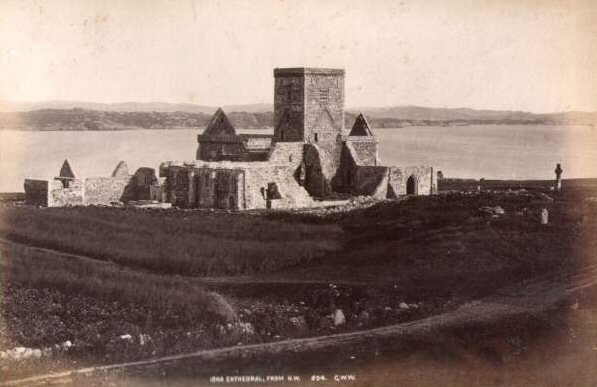 In 1899 the 8th Duke of Argyll gifted Iona Abbey, with its associated buildings such as The Nunnery, and also the ancient crosses and monuments,to the Church of Scotland, who formed the Iona Cathedral Trust. The Duke's proviso was that the Abbey should be restored once again to a place of worship. 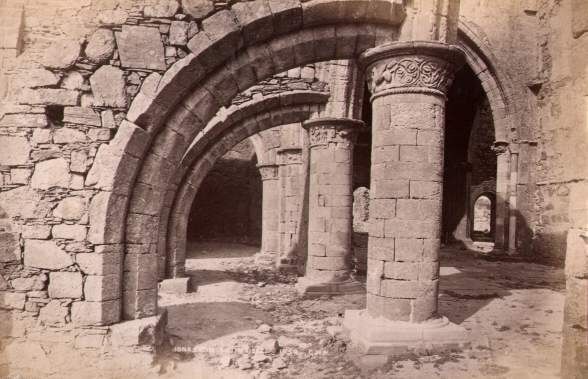 The Abbey was re-consecrated in 1899, and this small piece, no doubt along with other smaller items, were sold to commemorate this major turning-point in The Island's history. Though the outline of this cross is obviously that of St Martin's Cross, it is worth noting the typical Victorian engraving on both the front and the back. 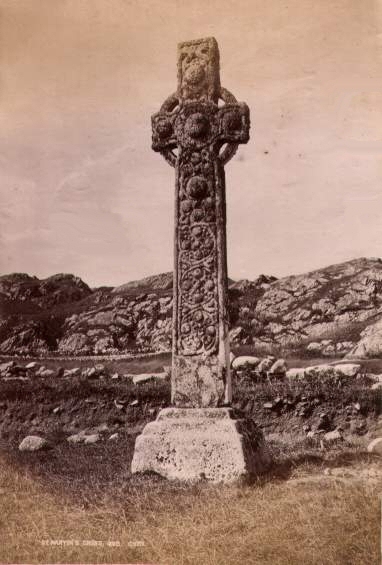 Until Alexander Ritchie moved to Iona with Euphemia in 1900, Celtic designs were carried out 'freehand' on Victorian jewellery, and were strikingly basic and elementary, like the knotwork on the back of this cross. This in no way detracts from the beauty and rarity of these items. This 1896 Iona cross predates any silverwork of Alexander Ritchie by at least five years. When the Ritchies moved to Iona and set up their business in 1900, their first pieces were carved wooden items, along with repousse brassware. 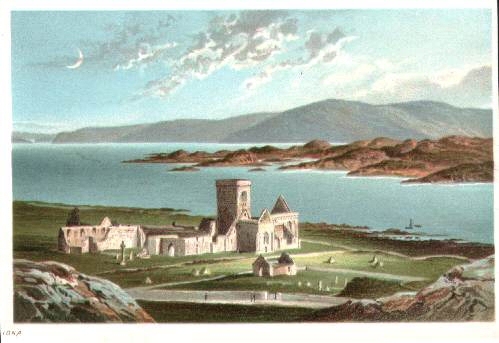 The earliest known Ritchie silver piece dates from 1902..
Rare chromolithograph from 1891 of Iona Abbey ruins, with the Isle of Mull in the background. You can just see St Martin's Cross in front of the Abbey ruins, as well as a fine crescent moon in the sky to the left. Size of original picture is small, approximately 5" x 3". Three Victorian pictures dating from 1885 by George Washington Wilson. The first picture is of the 10th century St Martin's Cross - as then untouched and majestic, with an aged coating of lichen on its surface. 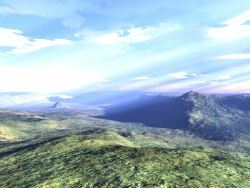 The second shows the ruined Abbey surrounded by long grass, with St Martin's Cross on the far right of the picture, and the Isle of Mull in the background. The third shows part of the interior of the ruined and roofless Abbey, with a finely decorated column in the foreground. The foliate carving at the top of this column was used in various formats by Alexander Ritchie on his silver jewellery and metalwork, as well as in one-off woodcarvings. 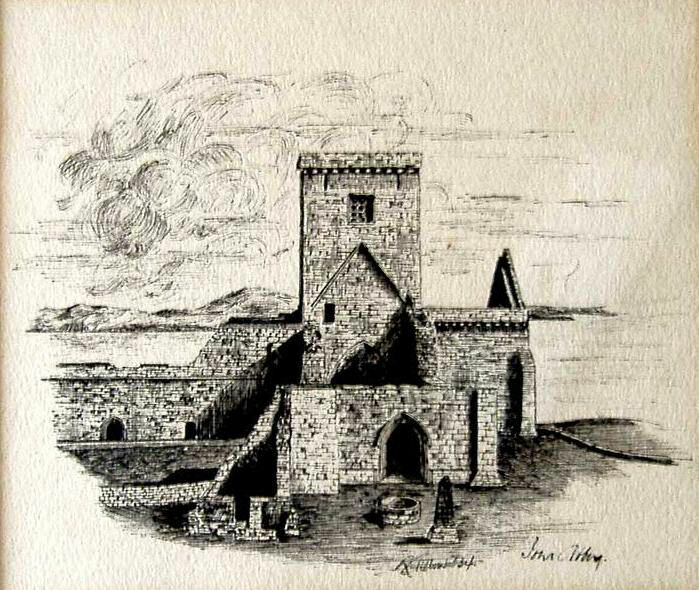 Steel engraving of Iona Abbey and its surroundings. This is by the artist/engraver Pennant and is an original dating from 1772. Note the deer in the right foreground. Possibly artistic license, as there are certainly no deer on the island today, and it is doubtful if there were in Pennant's time either. 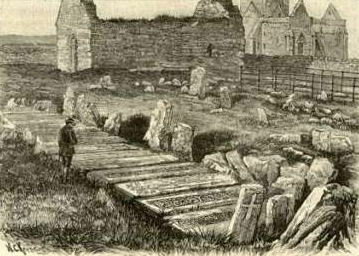 Early 1898 steel engraving of the Reilig Odhrain, or Burial Ground of the Kings - on Iona. The ruined Abbey can be seen in the background, and some of the carved gravestones in the foreground. Fascinating pen-and-ink sketch of Iona Abbey, signed 'R Willow', and dated 1834. Possibly an inspired visitor to the island? The above St Martin's Cross is not a photograph but deserves to be included in this section. It is a very early ceramic freestanding mantelpiece cross by the well known company W.H. Goss. This cross dates fom the late 1800's, and has a date on the base of 1899. St. Martin's Cross was one of Mr Goss's favourite Crosses, and he arranged for a large replica to be used as his memorial in Hartshill cemetery, Stoke On Trent. 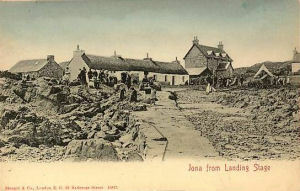 Postally-used card dated 1900, showing the landing-jetty on Iona. Note the three thatched crofts at the head of the jetty. A fascinating glimpse into Iona 106 years ago - being almost to the year when Alexander and Euphemia Ritchie came to live permanently on the island and develop their legendary craftwork business.